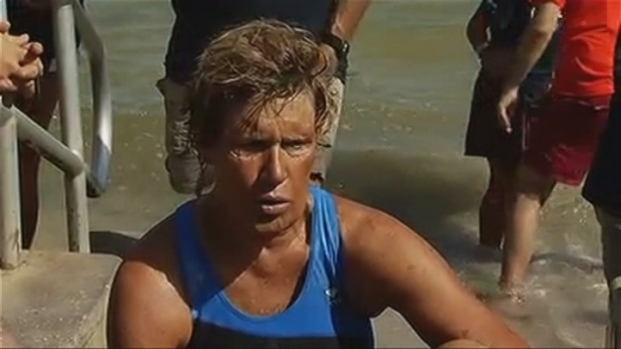 Endurance athlete Diana Nyad will attempt a swim from Cuba to the Florida Keys without a protective shark cage for the fourth time in three years. The Florida Strait, a dangerous stretch of sea full of sharks and jellyfish that is prone to sudden, violent storms, has stubbornly resisted Diana Nyad's repeated attempts to conquer it. Yet the Florida-raised endurance athlete was back in the water once again Saturday, launching her fourth bid in three years to become the first person to swim from Cuba to the Florida Keys without a protective shark cage. "I admit there's an ego rush," Nyad said. "If I — three days from now, four days from now — am still somehow bringing the arms up and I see the shore ... I am going to have a feeling that no one yet on this planet has ever had." She expects to take about 80 hours to arrive somewhere between Key West and Marathon, more than 110 miles (177 kilometers) from Havana. Diana Nyad swam a ceremonial final leg to shore in Key West Tuesday afternoon after ending her latest attempt to swim from Cuba to Florida earlier in the day. As soon as she walked onto the sand, a welcoming committee gathered on the beach sang "Happy Birthday" to Nyad, who turns 63 on Wednesday. She expressed a bit of disappointment about failing to make her complete, ambitious journey, but said she got a life lesson out of it. Nyad, who recently turned 64, tried three times in 2011 and 2012. Her last attempt was cut short amid boat trouble, storms, unfavorable currents and box jellyfish stings that left her face puffy and swollen. She says this will be her final try. She has said the same after previous defeats, but likened those statements to the rash promises of a heartbroken spouse. "Every person who's married, the day after they get the divorce they say, Never again!" Nyad said. "But you need to heal, your heart needs to heal, and pretty soon not all men are bad again." Nyad has spoken of night swimming in particular as a mystical, almost out-of-body experience where she finds herself contemplating the nature of the universe. Still, she acknowledged some might wonder, "Why would I come back to a place where maybe I'm lucky I didn't die before?" The answer is that it's a longtime dream she's been unwilling to give up, and she said she shares an emotional bond with Cuba unlike any other place she might have chosen for a marquee swim. Nyad hopes a new silicone mask will protect her from jellyfish at night when they rise to the surface more. She'll also don a full bodysuit, gloves and booties. The kit slows her down, but she believes it will be effective. A 35-person support team will accompany her at sea. Equipment that generates a faint electrical field around her is designed to keep sharks at bay, and she stops from time to time for nourishment. Australian Susie Maroney successfully swam the Strait in 1997 with a shark cage, which besides providing protection from the predators has a drafting effect that pulls a swimmer along. Nyad also made an unsuccessful attempt in 1978 with a cage. In 2012, Australian Penny Palfrey swam 79 miles toward Florida without a cage before strong currents forced her to abandon the attempt. This June, her countrywoman Chloe McCardel made it 11 hours and 14 miles before jellyfish stings ended her bid. Amid shouts of "Onward!" from supporters, Nyad jumped from the seawall of the Hemingway Marina into the warm waters off Havana Saturday morning. "My adrenaline is pumping very hard," she said. "Which means in one half I'm excited. I did all the training. The body is ready. My mind is ready. On the other hand, I admit I'm scared."